It’s done, another transfer has closed, and though I am sure many of you out there are left feeling frustrated, I don’t think that we can chalk this off as a ‘same old Wenger transfer window’. I remember about a month ago, I was back in London and it was not long after we had confirmed the signings of Sanchez and Debuchy. I said to a fellow Gooner; “you know what? If we don’t sign any more players I will still think this has been a good transfer window”. Of course that was before the departure of Vermaelen, but still, it is amazing how quickly the positivity passes and we are back in the habit of feeling hard done by. "How do you turn something yellow into something red? ...... By playing Flamini at centre back." And let’s face it, we are an injury or two away from that scenario. I do find it puzzling that we let Miquel leave to Norwich without having signed a backup CB. It seems that Miquel is just the next in a long list of academy players that are good, great even, but just not quite great enough for the Arsenal. Still, I would rather see him back there in a pinch than the Flame or Nacho. I am assuming that the boss feels that Chambers has proven his worth as CB cover. I disagree to an extent. I think he is a real player, but just a little too raw at this stage to provide a reliable option. He will, from time to time, misjudge the flight of the ball or dive in a little two quickly (as he did against Leicester but got away with it). But he will improve and let’s hope he shines (both for the Arsenal and England). Let’s talk about who we did sign. Whenever you feel frustrated about this transfer window, just remember one thing…we got Alexis Sanchez! Do not underestimate the significance of this bit of business. Thirty five mil was a good price for one of the stars of the world cup, and we saw off strong interested from the shellsuit wearing Scoucers, who were very keen and also offering champion`s league football. He is a truly world class player and there is a lot lot more to come from him. We solidly covered the loss of Sagna and even added a little depth at that position with Chambers. I do think Chambers has strong potential to not only add cover at CB, but also in defensive mid (our missing player). He showed some good DM qualities against Leicester pushing out from the back and intercepting higher up the pitch. Another event that was largely overlooked was seeing off interest from Atletico Madrid for Cazorla (if the papers are to be believed of course). This signals a sea change, as in past years the money would have been too tempting and he would have been out the door quicker than John Terry dragging a mistress off to an abortion clinic. Finally let`s talk about the deadline day piece of business we did get done. Young Danny Welbeck is now an Arsenal player. When I saw this confirmed it spurred mixed feelings, but now it has had a little time to sink in, I think it is a good bit of business. I have always had a soft spot for Welbeck and wanted him to do well for England. Do I think Sturridge is a better striker? Yes I do. Could I have continually suffered his unbelievably annoying goal celebration dance week in week out without? No I could not. Also, I do think Welbeck is a better all-round player than Sturridge, especially when it comes to tracking back and being selfless when it is the better option. 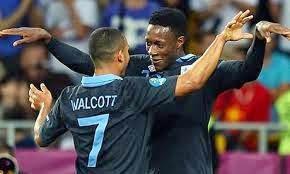 The other big thing to remember is that Theo and Welbeck seem to link up well. Cast your mind back to England vs Sweden at the 2012 Euros. What an assist and what a goal!!! Wenger always jokes in press conferences that soon the majority of the England team will be picked from Arsenal. Though he jokes, I do think he likes the idea of that. Maybe it is a by-product of the criticism he used to get for not having very many English players in the team. Whatever the reason, I do think that a good young core of players staying consistent for club and country will only be a benefit for both. Look at the success the Spanish team and big La Liga clubs had when many of their players we sourced from only a few teams. It can only breed improved understanding and comradery. There is a lot to be positive about. Let`s not forget, we finally got rid of Bendtner. I do think we have moved to a new era, if not, we would have made one or two average signings and would have let Rambo go to a direct rival.